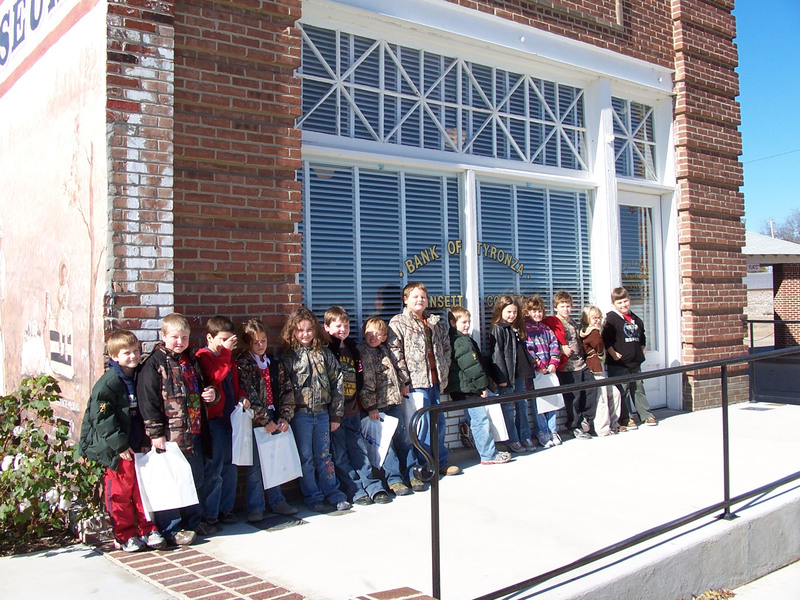 Schoolchildren visit the restored Old Bank of Tyronza building, now part of the Southern Tenant Farmers Museum. The Museum offers activities for seniors and youth, as well as an oral history room. Tyronza, Arkansas, (population 918) was established in the mid-1880s. Originally a railroad town, Tyronza initially grew through its lumber industry, which logged the swampy region of its old growth oak and cypress. Once cleared, the remaining cut-over land was ideal for crops such as cotton and rice. Difficult weather conditions throughout the 1920s resulted in farm foreclosures, and many local farmers fell into sharecropping. After World War II and the increased mechanization of farming, many Tyronza families moved to urban areas to find employment. Today, Tyronza is a thriving but primarily residential community with many of its residents driving to Memphis, Tennessee, for work. With the creation of a historic district commission, the town is now in the process of getting the historic downtown designated on the National Register of Historic Places. The commission is meeting to develop a preservation plan and discussing the implementation of ordinances to ensure the preservation of the town’s historic structures. Tyronza also works regularly with the Arkansas Delta Byways coalition to promote the town and its historic and cultural assets. Local residents have joined forces with residents of five other local communities to form the Sunken Lands Regional Chamber of Commerce to promote the assets of the area. The Southern Tenant Farmers Museum, administered by Arkansas State University, is a state heritage site. The museum tells the story of the creation of the Southern Tenant Farmers Union, an organization founded in 1934, whose members sought fair treatment for tenant farmers. Its original headquarters has been carefully restored. The Old Bank of Tyronza building, which was next door to the headquarters, was included in the renovation. In addition to its collection, the museum offers classes for senior citizens and activities for scout and school groups, and operates an oral history room for recording, collecting, and archiving local history for public use. In February 2009, the museum began participating in the Parkin School Days events, which teach children about the activities and history of the union. Tyronza sponsors its Stars and Stripes Festival weekend every spring. The event features food, sporting events, performers, and a parade. Originally designed to honor veterans, the festival is expanding to include a Delta Roots Music Festival featuring music of the region, including protest music, due to the union’s important role in the community. In addition, the Southern Tenant Farmers Museum sponsors an annual quilt festival in March. Along with quilt exhibits, demonstrations of quilting techniques and classes are available. Local citizens participate by displaying their personal quilts on porches, clotheslines, and rails throughout the event weekend.